The following are the latest results contributed by HM Courts Service, for cases sentenced by West Sussex Magistrates’ Court sitting at Worthing from June 22 to 28. Royston Cooper, c/o Frankham Real Estates, Highstone House, High Street, Barnet, was fined £7,500 and must pay £170 victim surcharge, £421.50 costs, after admitting, as sole director of Frankham Real Estates, failing to complete remedial action at Luckista Grove, Billingshurst Road, Ashington, between May 15, 2017, and August 8, 2017, as required by a compliance notice for the caravan site. Frankham Real Estates, of Highstone House, High Street, Barnet, was fined £7,500 and must pay £170 victim surcharge, £421.50 costs, after admitting failing to complete remedial action at Luckista Grove, Billingshurst Road, Ashington, between May 15, 2017, and August 8, 2017, as required by a compliance notice for the caravan site. Paul Linfield, 46, of Bay Bridge Crescent, Felpham, was given a community order with Building Better Relationships programme requirement and Rehabilitation Activity Requirement, and must pay £85 victim surcharge, £85 costs, after admitting assault by beating in Bognor Regis on May 17, 2018; resisting a police constable in the execution of his duty in Bognor Regis on May 17, 2018. 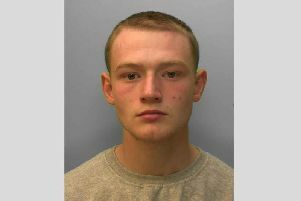 Thomas Hannan, 19, of Beaconsfield Lodge, Beaconsfield Road, Littlehampton, was fined £100 and must pay £50 compensation, £30 victim surcharge, £85 costs, after admitting using threatening, abusive or insulting words or behaviour with intent to cause distess in Barnham and Angmering on January 18, 2018. Jordan Freeth-Beer, 29, of Totland Close, Farnborough, was fined £300 and must pay £30 victim surcharge, £85 costs, after admitting drink-driving (64mg of alcohol in 100ml of breath) in Church Farm Holiday Village, Bognor Regis, on June 20, 2018. He was disqualified from driving for 18 months. Ben Morton, 42, of Sea Front, Hayling Island, was fined £200 and must pay £100 compensation, £30 victim surcharge, £85 costs, after admitting assault by beating in Chichester on March 17, 2018. Richard Powell, 50, of Landseer Drive, Selsey, was fined £100 and must pay £30 victim surcharge, £85 costs, after admitting wilfully obstructing a police constable in the execution of their duty in Chichester on May 23, 2018.